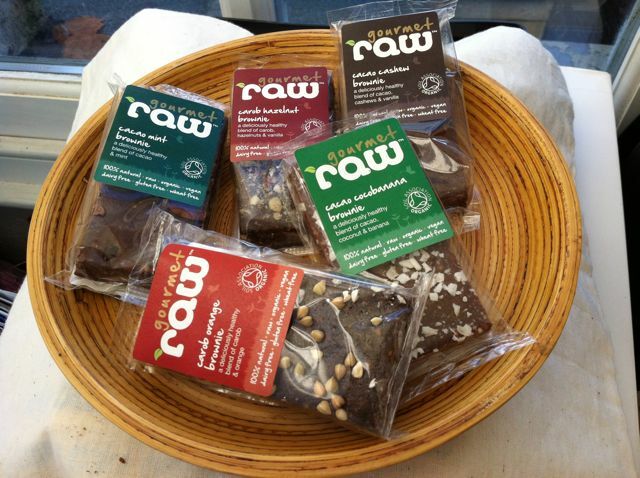 When I was asked to review some raw organic brownies from Gourmet Raw, I was really excited. I’ve been impressed with all of the raw chocolates I’ve tried so far and have found all of them to be very tasty. As the name suggests, all products are raw; they are also organic, vegan, GM, wheat and dairy free. With the added claim that they are not going to do me any harm and might do me quite a bit of good, I’m glad I was given this opportunity to try some more. Although these are described as brownies, they don’t bear much relation to brownies as most of us know them. The texture is chewy, nutty, granular even which gives them a substantial mouth feel. But don’t let that put you off, they are moist, flavoursome and have a balanced sweetness about them which makes them quite delicious. They are in fact quite similar in taste and texture to the chilli pie that we are lucky enough to have stocked in one of our local shops. These brownies are a great way to indulge without feeling too guilty. At nearly £2 for a 55g bar, these brownies are not cheap, but I loved them. However, they are delicious and strangely satisfying. One bar is really quite filling and doesn’t leave you feeling as though you need more. Maybe it’s because they are packed full of nutritious ingredients. They carry the Soil Association symbol, which pleases me as this is the organic certifying body that I trust the most. I think these are probably worth every penny and would make a wonderful gift for your health minded Valentine. Cacao Cashew Brownie – cashews, coconut palm nectar, buckwheat, dates, cacao powder, pecans, almond butter, cinnamon, vanilla, Himalayan salt. This smelt chocolatey with the sweet aroma of vanilla and was nuttily delicious. Cacao Mint Brownie – coconut palm nectar, cashews, buckwheat, dates, cacao powder, cacao nibs, almond butter, vanilla, mint essential oil, Himalayan salt. Mint is a flavour that can be hard to get right. They hit the spot with this one though and the refreshing mintiness was a lot more delicious than I was expecting. Carob Orange Brownie – coconut palm nectar, cashews, buckwheat, dates, hazelnuts, carob powder, vanilla, orange essential oil, Himalayan salt. Like mint, orange can be a difficult flavour to balance correctly. That wasn’t a problem here. The brownie smelt sweetly of orange and the flavour was just right. I did miss my dose of Theobroma, although I do like carob. The toasted buckwheat on top gave a nice crunch to the proceedings. A self confessed greedy sceptic, CT enjoyed this one. He thought it had a pleasantly orange taste was quite sweet, and the flavour combined well with the carob. He also liked the crunchiness. He concluded: ” I don’t know whether it’s good for you or not, but I like it”. Cacao Cocbanana Brownie – cashews, coconut palm nectar, buckwheat, dates, banana powder, coconut flakes, cacao powder, coconut butter, vanilla, Himalyan salt. Topped with crunchy pieces of coconut, this was the dominant flavour, with the banana becoming increasingly prevalent the more I chewed. CT’s comment was “the banana inveigles its way in and reminds me that although I don’t like bananas very much, I’m not sure why”. Carob Hazelnut Brownie – coconut palm nectar, cashews, buckwheat, dates, hazelnuts, carob powder, vanilla, Himalayan salt. Another delicious offering, with the flavour of hazelnuts predominating and the carob coming through as a secondary. As a bonus I got to try three flavours of their recently launched crisps. I was quite intrigued by these, wondering how raw products were going to end up like a crisp. I tried the Spicy Thai flavour first – carrots, buckwheat, flaxseed, dried coconut, tamarind, olive oil, pink Himalayan salt, garlic, dried lemon grass, kaffir lime leaves, ginger. Although I quite liked the texture and they were indeed crisp, I wasn’t to keen on the flavour which reminded me more of salt and vinegar than anything else and I do not like salt and vinegar. I did detect a flavour of earthy carrots, however and I quite liked that. When the salt and sour had died down a bit I detected some warmth from the ginger and a flavour that might have been lemon grass. Lower the salt and omit the tamarind and these would be a really nice snack. Red Pepper – red bell pepper, carrot, buckwheat, flaxseed, lime juice, onion powder, olive oil, pink Himalayan salt, smoked paprika, garlic. The red pepper flavour leapt out immediately. I liked this one much more than the Spicy Thai as it wasn’t sour at all and it was also less salty. It had a wholemealy quality and was quite fibrous. I’d much rather eat these than a packet of standard crisps flavoured with monosodium glutamate. They had the added bonus of not being greasy, but were more like a tortilla chip than a potato crisp. Beetroot – beetroot, orange juice, carrot, buckwheat, flaxseed, extra virgin olive oil, pink Himalayan salt, dried dill, onion, Provençal herbs. Despite my love of beetroot, I did not enjoy these ones at all. The only resemblance to beetroot I could find was the colour and they tasted pretty much like cardboard. Weirdly, CT (the confirmed beetroot hater) quite enjoyed them. They look unusual but I’d live to try them. I’m really into the whole raw food thing at the moment. Very nice but strange the beetroot one was not so nice I would have imaged that was the nicest! Dom, I have occasional flirtations with raw food, but it never lasts very long – comfort food has too strong a hold. But these brownies were truly delicious. Sadly disappointed by the beetroot crisps but they might have done it for you. REally interesting review Choclette, normally I’d run a mile from s]products like these, but I’ll give them a go if they’re in my local health food shop. I particularly like the sound of the Spicy Thai crisps – I LOVE salt and vinegar!! These look interesting. I’ll have to give them a try especially the crisps! Actually, I could really do with a packet of the red pepper crisps right now. Oh, the brownies look good! Shame they’re so pricey. I shall look out for them in my health food shop. It’s true they aren’t particularly cheap, but there is a lot of nutrition packed in and they are very tasty. These sound great – just my kind of healthy yet indulgant snack. Plus from the look of the ingredients they are gluten free as well as wheat free – hurrah! Love the look of the chewy squishy fruits and nuts. I’d like to try some RAW crisps! I tried some of the brownies today and it wasn’t really my cup of tea. Impressive to think they were raw food though. I’m not keen on beetroot but everything else sounds yum!